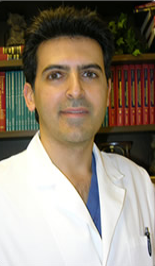 Dr. Ramin Shabtaie graduated from the University of California, Los Angeles School of Dentistry. Subsequently, he completed and Oral and Maxillofacial Surgery residency training at UCLA Medical Center. Dr. Shabtaie is on staff at the UCLA Medical Center, and has formerly been on staff at Cedars Sinai Medical Center. He is a lecturer for the Department of Oral and Maxillofacial Surgery at UCLA. He was a clinical instructor at Cedars Sinai Medical Center Department of Dentistry/Oral and Maxillofacial Surgery. Dr. Shabtaie is certified in Advanced Cardiac Life Support. He is able to treat patients in the hospital, outpatient facilities, surgery centers and in his private office. Dr. Shabtaie is also a state examiner for general anesthesia, providing and monitoring standard of care in office anesthesia and sedation. Dr. Shabtaie uses only the best in dental implants from the most reputable dental implant manufacturers. This, coupled with his extensive years of highly specialized training and years of clinical experience has earned him the reputation of " Top Doc Oral Surgeon" Having performed over 10,000 surgical procedures to date- some on well known celebrities, including complex dental implant surgeries as well as reconstructive procedures, Dr Shabtaie is one of the top Oral and Maxillofacial Surgeons. With patients coming to see him both locally and from long distances, and other dentists and specialists seeking advice from him, Dr. Shabtaie is known among his peers to be a knowledgeable and experienced surgeon. Among his patients, he is well known for being caring and gentle. He prides himself in being a perfectionists, and very detail oriented. Shabtaie, R; Schwartz, H - Non-Hodgkin Lymphoma manifesting as a submandibular swelling, a case report. Yagiela, J; Chao, W; Freymiller, E; Shabtaie, R - Efficacy of acupuncture in control of post-oral surgery pain. (Presented at 1995 UCLA School of Dentistry Table Clinic).